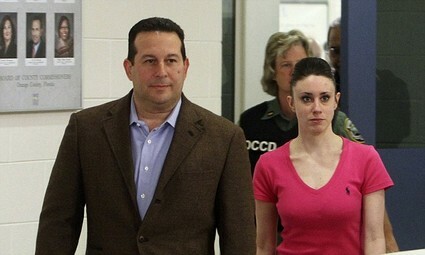 Murder Mom, Casey Anthony, celebrated her release from jail by guzzling beer and laughing and joking with her legal team. Even worse, these acts that are said to be caught on a video being shopped around by her representatives trying to book the murderer for big money interviews. In the video footage, Casey is seen holding a half-empty Corona beer bottle and smiling as she gets off a private jet at an Orlando area airport, according to TMZ. The plane reportedly belongs to one of Casey’s former attorneys, Todd Macaluso, who was also on board the aircraft. Casey walked out of jail a free woman on July 17, 2011 after being acquitted by a jury of her peers just a week earlier of killing her toddler daughter, Caylee Anthony, 2, in the summer of 2008. At one point in the video, Casey can be heard using legal terminology saying, ‘I concur.’ Later, someone screams, ‘De plane, de plane,’ and laughter can be heard erupting among the group. It is unknown where Casey is hiding out these days as she waits for the offers to come in. It was reported recently that her asking price for an interview is now $1.5 million. We can only hope that other mothers looking for fame and fortune will not follow Casey’s lead.